For many organisations, trade shows and events play a huge role in their marketing strategy. One of the most popular methods of lead capture at trade shows are rented badge scanners, which allow exhibitors to scan people’s badges and get back a list of contacts after the event. Do badge scanners work for event exhibitors? Do badge scanners work for event visitors? Is there an alternative to hiring badge scanners? Trade shows and exhibitions provide all attendees, speakers and exhibitors with name badges on arrival. The event organiser then provides badge scanners for exhibitors to hire for the show, to use as lead retrieval devices. For exhibitors, badge scanners offer a way to quickly and easily collect people’s contact details, by scanning their badge as they talk to attendees at their stand. After the event, the event organiser sends the exhibitor a list of people’s details: everyone whose badge they scanned during the show. This can take between a couple of days and a couple of weeks to be sent over, and the waiting time varies between shows. While there have been attempts to modernise the badge scanning process by introducing wearables and smart badges, the basic process remains unchanged from when it was first introduced, decades ago. If you’re an exhibitor, the only part of the badge scanning process that you see is the instant when you scan someone’s badge at your stand. But the process is more complex than that. An attendee registers for the event. They provide their contact details, and choose whether or not they want to receive follow-up communications from the event organiser and exhibitors at the show. The attendee’s details enter database. The event organiser stores all attendee details in a database. The attendee collects their badge at the start of the event. Badges normally have a barcode or QR code printed on them. An exhibitor speaks to an attendee at their booth. They scan the attendee’s badge using the badge scanner they’ve hired. In some cases, they may have additional barcodes to scan, to add further information about that person. After the event, the organiser distributes lists of badge scan data to the exhibitors. This is a list of everyone whose badge they scanned during the event. In the EU, the introduction of GDPR changed the way businesses collect, process and use people’s personal information – and similar regulations are in force around the world. This meant that event organisers had to change the way they collect attendees’ details when they register for a show. Now, when someone registers to attend an event, they have a choice as to whether or not to share their personal contact details with exhibitors. Crucially, it can’t be mandatory for the attendee to opt-in and say ‘yes’. This means that it’s possible for someone to register for and attend a trade show, but withhold consent for the exhibiting companies to contact them afterwards. Or to register with fake details to avoid any follow-up communications. If you’re an exhibitor using a badge scanner for lead retrieval at a trade show, you have no way of knowing whether the person you’re speaking to has opted out of follow-up comms. So you could invest a lot of time, energy and money exhibiting at a trade show, only to find that your spreadsheet of badge scan data is littered with empty rows, where attendees have opted-out to avoid the influx of generic follow-up emails. Badge scanners are a popular lead capture option for exhibitors, thanks to the speed with which you can collect someone’s details. If you’re the rep on a busy stand, it’s easy to scan someone’s badge while you’re talking – without needing to stop and write out their name, email address and job title. However, this is only true for the event reps or salespeople who are at the booth or on the trade show floor. For the marketing team back at the office, badge scanners are frustrating. It takes days, if not weeks, to get the badge scan data back from the event organiser. Your sales team can’t start to follow-up with any of your trade show leads until this comes through. Badge scan data is often poor quality: full of typos and out-of-date contact information. Since the introduction of GDPR, it’s increasingly common to get sheets through with redacted information too – so you can see that your team collected a lead, but not who that person was. So while badge scanners are popular due to their speed and ease-of-use on the show floor, it’s clear that they don’t meet everyone’s expectations. The events team will also feel the knock-on effect, so all the speed on the show floor is actually counter-productive. Badge scanners are a very easy method for attendees to share their contact details with exhibitors at events. But while it’s easy and convenient at the show, it’s a different story after the event. The badge scan process I detailed earlier means that it takes a long time for exhibitors to follow-up with the visitors to their stand – often more than a week after the show ends. But as a consumer, we’re used to getting information now. We’re used to immediate notification emails when we buy something online, or replies within a matter of hours if we reach out to a company online or on social media. As a consumer, we’re used to waiting minutes or hours – not days or weeks. If you’re using a badge scanner to collect leads at a trade show, it may work well for you on the stand, but it doesn’t work for the attendees – your potential customers. 20 years ago, badge scanners were cutting-edge event technology: reps on the trade show floor no longer finished each day with reams of paper, hastily-scribbled contact details, and piles of business cards to try and match up with the conversations they had. Instead, they could use a handy scanner to scan barcodes on the badges of everyone they spoke with, to capture their details in a quick and unobtrusive way. But since then, the world, and your customers’ expectations, have changed. Unfortunately, the way we collect leads at events has not. I visited a large trade show in London recently. One company I spoke with had hired several badge scanners to use for the duration of the event. However, they weren’t able to collect enough information from scanning people’s badges, so they were supplementing badge scanning with a notepad and pen, where they scribbled down additional notes or reminders about conversations they’d had with attendees. Paper lead capture forms. Paper forms are still one of the most popular lead capture methods used at events, because they’re flexible and easy to use. But they bring back all the problematic and time-consuming manual data entry that exhibitors are trying to avoid with badge scanners, so aren’t a perfect solution. Collect business cards. When you scan someone’s badge at an event, most of the time you only get their basic contact information: name, email address, company, job title. All of that can be found on their business card. But not everyone carries business cards and, again, they’ll give your team lots of manual data entry. Online lead capture forms. Some companies have started using tools like Typeform or Google Forms to set-up online lead capture forms. These look great, but are difficult to customise. And run the risk of breaking down entirely if the trade show Wi-Fi isn’t up to scratch. Many companies hire badge scanners at trade shows because it’s what they’ve ‘always done’. 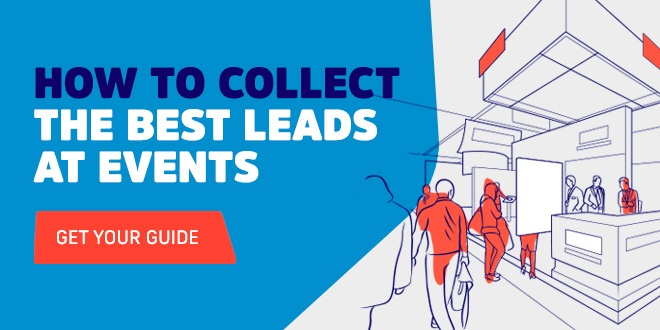 But a little bit of research can reveal more efficient ways to collect leads at trade shows – methods that can save on data entry time and also collect more detailed, contextual information rather than just a list of contacts. Today’s consumers are used to getting information at the click of a button. At the very latest, same day. But if you use badge scanners to collect leads at trade shows, you’re going to fall far short of their expectations. For starters, it normally takes a week, if not longer, for the event organiser to send out the badge scan data. Then your team has to spend time getting that data into a format that can go into your CRM. Only once the data’s been tidied up, and your CRM team has loaded it onto the system, can your sales team start following up. By that time, the event was weeks ago and your prospects have forgotten all about you. Your customers deserve better. It’s time to leave trade show badge scanners behind, and switch to an event lead capture solution that can cope with the pace of modern sales, marketing and business.